Copa Airlines will become the first interamerican airline to put lie-flat business class seats on Boeing 737s. In plans and seat maps for its forthcoming Boeing 737 MAX 9 jets, Copa is depicting B/E Diamond flat bed seats. The new seats are advertised as “Dreams Business Class”. This could make flat bed seats available on significantly more Latin American routes from the U.S.
Copa generally makes plenty of business class available to United MileagePlus and other Star Alliance partners. United MileagePlus members can also use miles and premier upgrade certificates to move into business class on Copa flights. Diamond seating should be familiar to frequent flyers. The product is used by American Airlines on its Airbus A321s, Delta Air Lines on Boeing 757s, and United on Boeing 757s, 787s and some 767 and 777s. 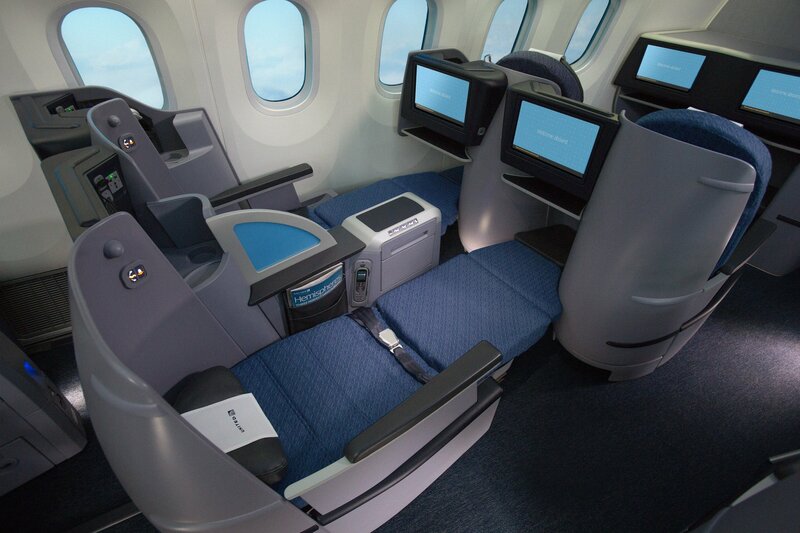 The B/E Diamond business class seat, deployed into a bed on a United 787 Dreamliner. Copa isn’t the first airline to install lie-flat seats on a 737. FlyDubai has executed plans to install a version of JetBlue’s Mint seating on its new MAX aircraft. Currently, Copa operates a fleet of 82 737s, which it flies to the United States, Canada and the further reaches of Central and South America. From its hub at Panama City Copa flies 737-800 next generation jets to the U.S. East Coast, Midwest, California and Toronto, but those aircraft don’t have range to reach the U.S. Pacific Northwest. The new MAX jets will start arriving this fall. Another 9 are expected in 2019. Eventually, Copa has plans to renew its new fleet with the 737 MAX 8, 9 and 10 variants, with 71 jets on order, per FlightGlobal. Presently, Copa installs upgraded first class recliner seats — with legrests and footrests — on its 737 fleet. The 737 MAX 9’s extended range will allow Copa to reach the U.S. West Coast, connecting the farthest reaches of North America (sans Alaska) with southern South America through its Panama City hub. Some of those flights may approach 8 hours. Copa is also introducing a new segmentation in its extra legroom economy seating. In addition to extra legroom and recline, the economy extra seats will have 10-inch seatback entertainment screens. Standard economy seating on the MAX 9 will not. COPA Airlines Economy Extra on the Boeing 737 MAX 9 will have 10-inch seatback screens. Regular economy seats will not have in-seat entertainment. Image by Copa Airlines. Copa’s new lie-flat seats will be an excellent use of Chase Ultimate Rewards points, transferred to United (more info). Copa is one of the most reliably available United partners, in both economy and business class, and offers lightning fast connections to most Central and South American cities through Panama City. Copa is also a member of Star Alliance, meaning Copa awards can be booked via Aeroplan, for American Express Membership Rewards members, or Avianca LifeMiles for Citi ThankYou Rewards members. United’s own MileagePlus Explorer card is also a great way to score bonus miles that can be quickly and easily applied to Copa business class or economy class award flights. With longer range jets and transoceanic business class seating, Copa may soon become an option for long, difficult-to-find award routes, like New York City to Buenos Aires, California to Chile, and Canada to Brazil. What a fantastic new way to traverse Central and South America. Lets hope Brazilian carrier GOL also installs lie-flat seats on its new MAX 8 jets, which start flying later this fall between Brazil and Florida.